Popular singer, David Adeleke, popularly known as, Davido has revealed why he decided to opt for the one-year mandatory National Youth Service Corps (NYSC). Since he uploaded evidence of his youth service on social media, the internet has been bubbling with reactions of different kind, while some showed surprise he opted for the program, others urged him to donate his stipends to them since he won’t be in need of the cash. The ‘OBO’ crooner who shared photos of himself in NYSC uniform after his registration at the Lagos NYSC camp on Tuesday was reported to have caused a stir at the Iyana-Ipaja orientation camp as he drove his white Mercedes Benz GLE 450 marked POLICE PF 413SPY into the camp. 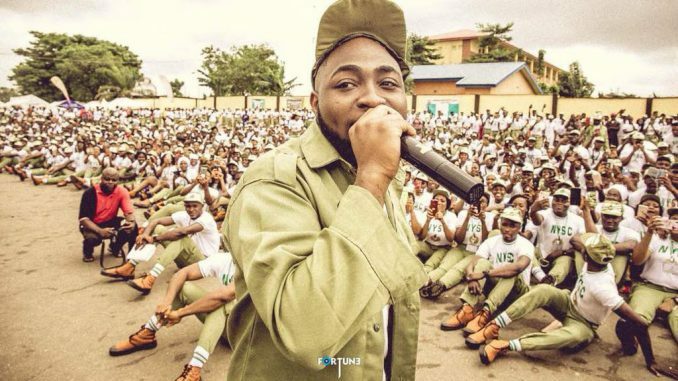 Davido, upon signing his oath of allegiance form, told newsmen at the NYSC camp that he registered for the scheme due to his strong passion for NYSC.